Does your child struggle with low self esteem? Is bullying a problem? Maybe they lack social skills because of today’s social media culture hurting our youth’s one-on-one communication skills. Do you see your child struggling with a possible screen-time addiction? What are your thoughts about the Millennial work ethic? What can we do about these insidious cultural norms? You might just find the solution on four legs! Don’t underestimate the incredible ability of horses to help an individual overcome some of these obstacles, low confidence, fear and self doubt! Leaders are born at the barn. Four-legged life coaches: Vaulting instills confidence!. With a horse, a child (everyone really) is quietly invited and encouraged to become the leader. Learning how to care for such a large, dependent animal fosters feelings of connection, compassion and levels of unspoken communication that are critical life lessons and bring success skills that take decades for most people to master. 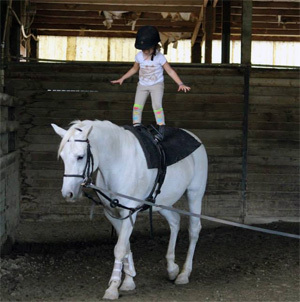 There are many reasons why therapeutic riding centers are a thing! They help troubled teens, abused women, lost souls and all kinds of people with physical disabilities. The corporate sector has even found horses to be excellent leadership teachers for their management with retreat sites popping up all over the country! Each time a child or teen learns a new skill at the barn with a horse as their partner, self-confidence and trust increase. As you learn to effectively manage your emotional as well as both your gross- and fine-motor skills, you will be simultaneously learning to manage the emotions and actions of a 1200-pound animal! This is an obvious confidence builder. The relationship humans have with horses is calming and brings both peace and healing. Horses are big, powerful creatures. They can be unpredictable and very intimidating. Approaching, handling and riding a horse forces a person to confront their fears and insecurities. My cold shower theory does this as well (read my blog post from March 3, about slaying resistance). With horses, you learn how to keep your fear under control, stay calm and respond to the unexpected—hhhmmm, sounds like a useful life lesson! And for the adrenaline junkies—Let’s face it, Six Flags understands the attraction—those that are thrill seekers; the exhilaration of horseback riding meets the adrenaline-rush requirements. The intrinsic innocence of a horse reinforces an attitude of perseverance and kindness in a person. Horses are completely honest in their reactions and it teaches us a new level of awareness as well as giving us a level of connection that is uplifting and inspiring. Young people involved with horses learn emotional control because horses respond negatively to negative behavior and positively to positive behavior. When a young person encounters a horse’s behavior, and it confuses them, they learn to put themselves in another’s place to figure out what the horse is experiencing and then find ways to interact that will result in the desired outcome. Empathy lessons abound! Horses are great at teaching humans about themselves and their interaction with others around them. For all you parents—and I’m one too—wouldn’t it serve your daughters and sons well to know that they can get a larger, powerful creature to do what they want, when they want? The class bully doesn’t stand a chance when you know you have the abilities gained at the barn. With girls, because their affections are directed at horses that seem to always respond appropriately, the boys don’t end up being so all-consuming. Boy craziness is overshadowed by horse craziness, which certainly can have more desirable consequences. Time spent at the barn keeps your daughters appreciating nature, working hard for their passion and with less time to explore other less-desirable teenage passion-related activities. There is a horse show to get up early for, so drinking at the party is not such an attractive option. For both boys and girls, self-worth doesn’t take such a hit when the human object of their affection doesn’t respond according to expectations. The horses without their baggage have met that need as well as supply the nonjudgemental shoulder to cry on when the human connection has inevitably left a broken heart. Certainly the commitment and responsibility aspect of horse ownership also give children a leg up on maturity. 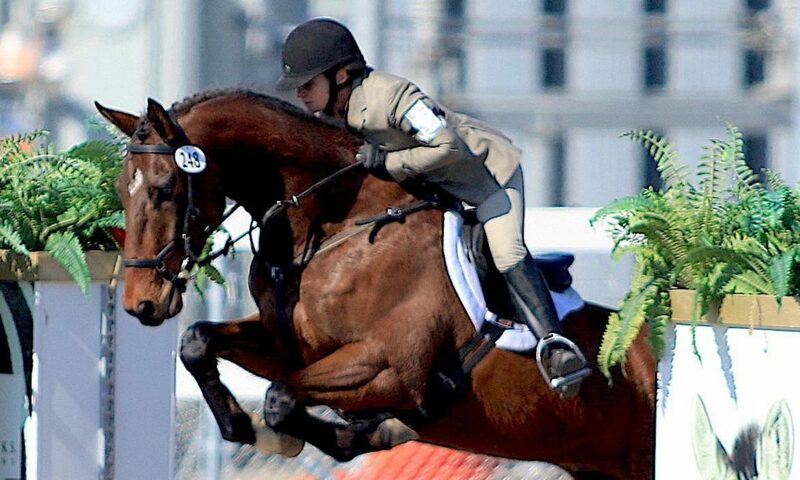 Because the equestrian life can be highly motivating, youth will find ways to get out of their comfort zone to be involved. Talking to adults, taking care of a sick or injured horse, setting goals, effective time management and learning to cope with disappointment are all evidence of a child on a healthy track to adulthood. A financial education is also included! Balancing a budget and understanding the value of money are all part of finding creative ways to ride and be with horses! When you want something you find a way. It is expensive, but so is rehab, unplanned pregnancy and counseling. There is an inherent sense of well-being that interacting with horses brings the human half of the equation. Horses are clearly a magical animal. Unicorns really do exist and what a gift it is to introduce someone who needs this magic in their life to all the benefits that this gentle creature provides! I so enjoyed reading this. What you say is completely truth, because I’m a horse lover and used to be a teenage girl (a long time ago) in love with horses! Thank you for this honest and very enjoyable writing! I had no idea that there were therapeutic riding centers were a thing. That is really nice that they can help troubled teens or children by teaching them new skills. I have noticed that my son has been having a lot of problems at school. I have been wondering what I can do to help him. I will have to consider taking him to a therapeutic riding center. Thank you for the information! Previous PostPrevious Discovering your power … slaying the resistance in your life.